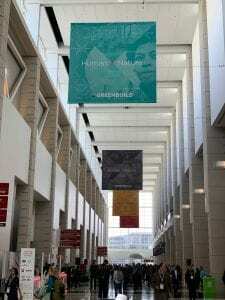 11/20/18: Greenbuild Chicago seemed to this New Yorker to be a tale of two cities. The ‘Second City’ hosted this year’s international conference that is the largest grouping of individuals and committed to sustainability in the world. While the number of attendees and expo seemed smaller than previous years, there was no reduction in the number of programs, white papers, enthusiasm, and innovation. 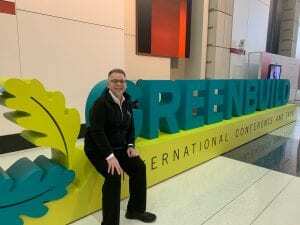 Michael Shilale, AIA, LEED, CPHC at Greenbuild Chicago 2018! Climate Resiliency – never more necessary! The opening plenary had moving presentations by Amal Clooney and Mahesh Ramanujam. USGBC, the organizer of the annual conference and the publisher of the LEED environmental rating system for buildings, had some fascinating revelations. Climate change and building residency have been dovetailed to create a mindset of climate resiliency. A welcomed admission and acknowledgment that as the climates changes we need to build more responsibility. There is also a new certification for Net Zero. A difficult standard that many buildings have already achieved. Imaging a building that creates more energy than it uses. Or one that uses no more potable water than it can create on site. Or imagine recycling and reusing so much solid waste that you send virtually nothing to a landfill. True sustainability demands we reach for these milestones. We learned of the commitment the public school system in Washington DC has made to ‘green’ their schools. They claim after salaries, they pay more for utilities than anything else including supplies for students. Since the year 2000, they have spent over 4 Billion dollars modernizing their buildings and building new schools. Recently they completed an evaluation of their buildings that measured the improvements in test scores, graduation rate, attendance, faculty retention, and several other metrics. All measurements were significantly better in the modernized and new buildings. The study was comprised of student and staff surveys, on-site measurements, and analysis of archival data. They measured thermal comfort, daylight, acoustical performance and indoor air quality and compared the data to the surveys, and other data at each building. The post-occupancy study confirmed that every metric showed positive effects of the green buildings, with daylight being the most important. Read more about the study in the November issue of School Planning and Management. This year’s theme was Human by Nature and many of the seminars address the human and economic benefits of green building. The WELL building standard, which goes beyond the LEED rating system, looks hard at human impacts. One scary statistic is that environmental toxins have made there way into our biosphere including our own bodies. While the concentrations of many of these toxins are low, the long-term impact of these toxins are not known. Some toxins are at concentrations above what some pharmaceuticals prescribe as human dosage. See their red list of chemicals that should be eliminated from our buildings and our bodies. One of my favorite parts of the conference is the BuildingGreen magazine’s list of Top Ten ‘Green’ products. For the last 17 years, Building Green has highlighted some of the best and brightest products in the sustainability world. Several of my favorites from this year’s list are; the custom aluminum sunshades, the PET resilient flooring in lieu of pervasive pvc flooring and the ground glass cement additive that reduces the need for Portland cement – a big contributor to CO2 emissions globally. The last product is from a company right here in the Hudson valley. A company called Urban Mining out of New Rochelle. See the entire list here. Plug loads are the next frontier for energy savings. As we increase the efficiency of our building envelopes and our building mechanical systems the unregulated and unmanaged plug loads take on a bigger and bigger share of our building energy use. Who would have thought copiers and coffee pots would use the most energy in our buildings. As a building gets more and more energy efficient, this is exactly what happens. There are many new strategies to deal with plug loads, some technical, some behavioral. Better we jump on the bandwagon before more regulation comes to this heretofore overlooked load category. Behavior Modification has always been part of our green building efforts. And as we strive for net-zero energy use, it is more and more relevant. Energy Star has so many tools for building owners to help reduce energy use. They have developed kits for campuses that encourage friendly competition to help occupants understand the reasons to reduce energy use and successful strategies to use. Titled the Battle of the buildings or War of the Watts, these strategies are fun and effective in getting occupants to buy into the benefits of greener cleaner buildings and environments. Create your own friendly competition here! A seminar on PACE financing was also enlightening. Growing nationally, the benefits of pace financing are many. Encouraging both owners and tenants to adopt energy-saving strategies has been a challenge since the owner doesn’t see the utility savings and the tenant doesn’t’ usually have the assets or ability to implement longer-term strategies. PACE financing solves this and many other problems. With terms of up to 30 years, unheard of in the commercial financing world, PACE financing permits the costs and benefits to flow through to the tenant, creating immediate positive cash flow while improving the owner’s property.